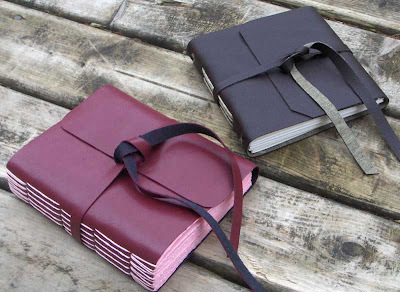 Periodically I get inquiries from people who like the appearance of my leather books and want to know if I can make something similar without using leather. I have done this a few times by request thus accumulating some pleather, vinyl materials and now I've decided to start offering them in my Etsy shop as well. So, I just added a couple to my shop recently. These books are both vegan and upcycled, since the cover materials are repurposed used clothing. Serendipity...I have been contemplating offering vinyl covers as an option for the Chameleon. When I was at the fabric store the other night there was some vinyl in really nice colors. I rarely find anything good in our local thrift shops in the way of clothing to recycle into books. Complete opposite situation here! Lots of stuff in some of the thrift shops, but my local fabric store has very little to offer for vinyl. This is a really good move. I've been thinking of trying soft rubber for covers to make journals for my vegan daughter and her friends. I'll look into the other things you've mentioned. thanks lorabutterfly. Perhaps a more accurate description of these books is: the cover materials are vegan and the papers are recycled. The threads are certainly unwaxed. And I didn't use any glues making these books - but I have no idea about the paper itself, since, with these books I was just using up scrap papers from other projects. But I wonder if there are any papers available that are actually marketed as vegan? Is there some way to determine if a paper has been treated with geletin?